The 7th Workers’ Party Congress concluded on May 9. The four-day event was marked by Kim Jong-un’s title being elevated to the Chairman of the Korean Workers’ Party (KWP). His previous title was the First Secretary of the KWP. 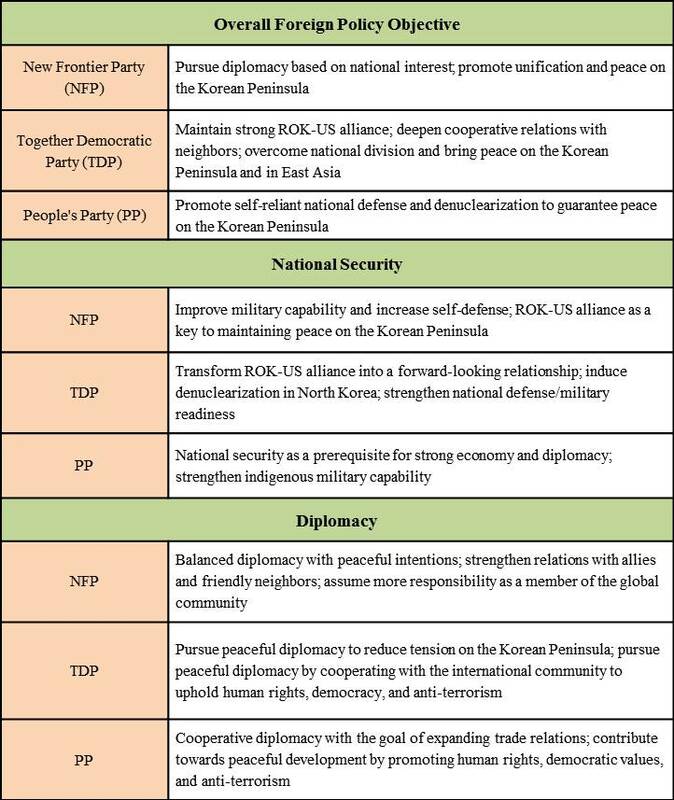 With the 7th Party Congress in the backdrop, there is growing interest in the foreign policy positions of three major parties in the National Assembly. 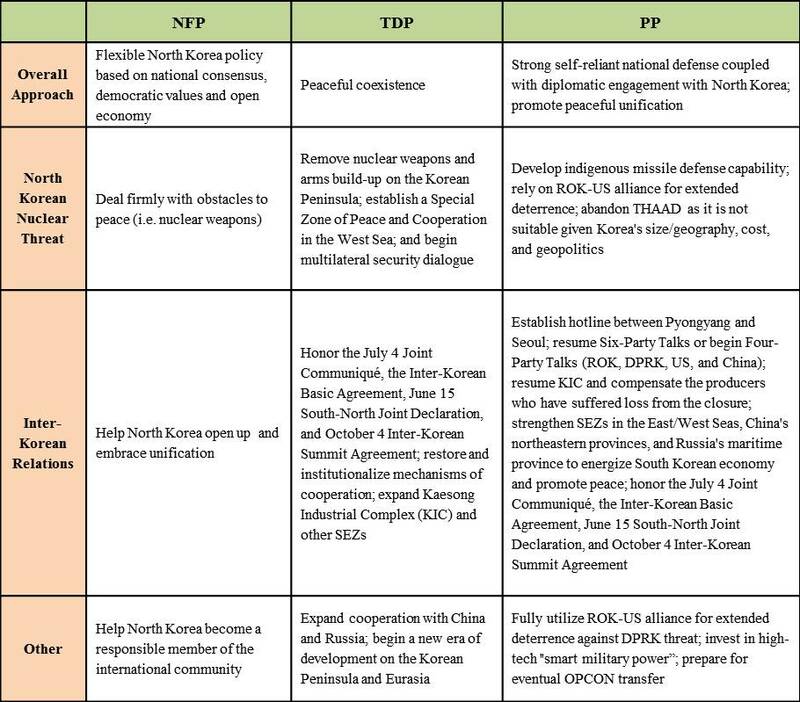 On North Korea, for instance, the three parties seem to hold divergent views: the TDP and the PP both favor engagement with North Korea while the NFP supports President Park’s hardline approach. The government is also mulling over the need to restructure certain overseas development operations among state-owned companies, such as the Korea National Oil Corporation (KNOC) and Korea Gas Corporation (KOGAS). The Ministry of Trade, Industry and Energy (MOTIE) commissioned a study on this issue and held a public hearing on May 20. * Special thanks to Jo Eun A for her comments and feedback. “外信 120명 불러놓곤 200m 접근 금지령… 기자들 ‘농락당했다,’” 조선일보, 2016년 5월 7일. “北 김정은 “북한은 핵보유국···자주권 침해받지 않는 한 먼저 사용 않을 것,” 경향신문, 2016년 5월 8일. “北 김정은, ‘경제발전 5개년전략’ 제시…電力 문제 해결 강조,” 조선일보, 2016년 5월 8일. “36년간 숙청 안 당하고… 살아남은 8人,” 조선일보, 2016년 5월 9일. “당 대표자 3467명 참석”… 노동당원 數 340만명 달할 듯,” 조선일보, 2016년 5월 7일; “북, 7차 당대회 예산 2000억 원 투입,” 중앙일보, 2016년 5월 13일. “[속보]NHK “北 김정은 노동당 위원장 취임”…정치국 상무위원에 김정은, 김영남, 황병서, 박봉주, 최룡해,” 경향신문, 2016년 5월 9일. “`北, 핵·미사일 개발 계속하면 제재·고립뿐`…정부, 김정은 당대회 개회사 평가,” 조선일보, 2016년 5월 7일. “국회 원 구성 협상의 정치학,” 한겨레, 2016년 5월 15일. “18개 유지·원 구성 시한 준수,” 경향신문, 2016년 5월 19일. 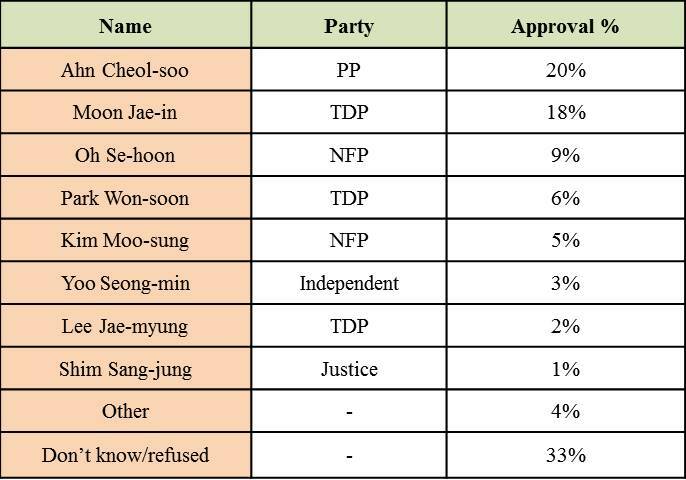 Date: May 10-12; sample size: 1,005; margin of error: +3.1% at the 95% confidence level. Date: May 17-19; sample size: 1,004; margin of error: +3.1% at the 95% confidence level. “국책은행 자본확충 가닥 잡았으나 속도감이 없다,” 한국일보, 2016년 5월 20일. “정부, 보유 공기업 주식 현물출자…韓銀은 자본확충펀드 간접 출자,” 동아일보, 2016년 5월 20일. “미리 군살 뺀 두산… ‘저성장 넘자’ 자신감,” 동아일보, 2016년 5월 19일. “수조원 손실 해외자원개발…대대적 구조조정,” 경향비즈, 2016년 5월 19일. “‘부실 자원개발’ 해법 찾을까,” 한겨레, 2016년 5월 19일. “석유-가스 公 해외자원개발 기능 떼내 통폐합,” 동아일보, 2016년 5월 20일. Press Briefing, Ministry of Foreign Affairs, 2016년 5월 3일. “박 대통령 ‘북, 이란 본보기 삼아 핵개발 중단하고 개방해야,” SBS 뉴스, 2016년 5월 17일; “박근혜 대통령, 북한이 이란 본보기 삼아 변화와 개혁의 길로 나설 것을 촉구,” 청와대 뉴스, 2016년 5월 17일. “황교안 총리 ‘이란 앙숙’ 사우디 방문,” 한국일보, 2016년 5월 20일.